Shizophragma Hydrangeoides Moonlight is a lovely, deciduous root climbing plant. 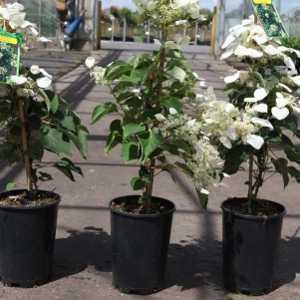 It is a fast growing plant with attractive, silvery green leaves with dark veins, during July it is adorned with lovely white flowers that are similar to lacecap Hydrangeas. The soil must be moist and assure constant water supply, but it needs good drainage. Grow against a wall, fence or into a large tree. Self clinging, it will attach itself to surfaces by aerial roots. Though shade tolerant, it flowers best in a sunny situation. Plant 60cm (2ft) from support and tie in until established. No regular pruning needed. 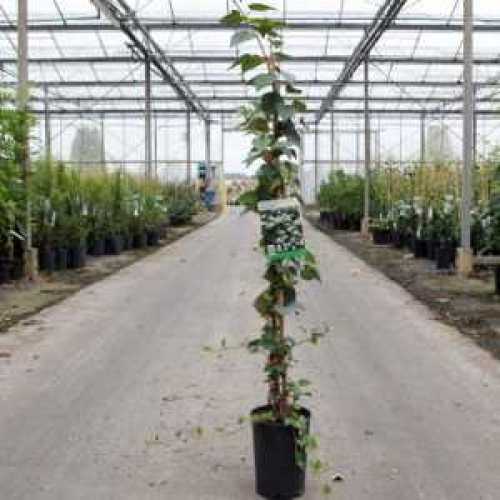 However trimming may be required to keep them to the space available, removing as much from the longer shoots as necessary.